This project started off as a diorama card and grew into a 10"x10"x5" framed diorama. There is a protective film covering the box which makes it look a little fuzzy and inhibits the ability to see all the 10 layers in the photos. The fun part is the ability to change background colors. There is a RBG remote battery powered LED strip in the back and 2 single LEDs that are linked to the RBG strip. Using the hand held remote, you can change the background to 18 different colors and the 2 single LED light posts will only come on when any blue color is selected and remain a soft white. Now that's a work of art - I just love it. The layers give such a glorious effect and the coloured lights work a treat. What an amazing piece of work. I love it. The leds are nifty as well. Where did you find them? Love the layered designs that light up. Ten layers! WOW. This is SPECTACULAR! The 5mm x 5mm x 2mm mega LED in the light post is from Evan Designs at modeltrainsoftware.com and the 0.5 battery powered 5050 RGB LED flexible strip light, 50 cm long, was purchased from hot-led on eBay. Waterproof LED strip was not necessary but what I found at a reasonable price that included the remote. 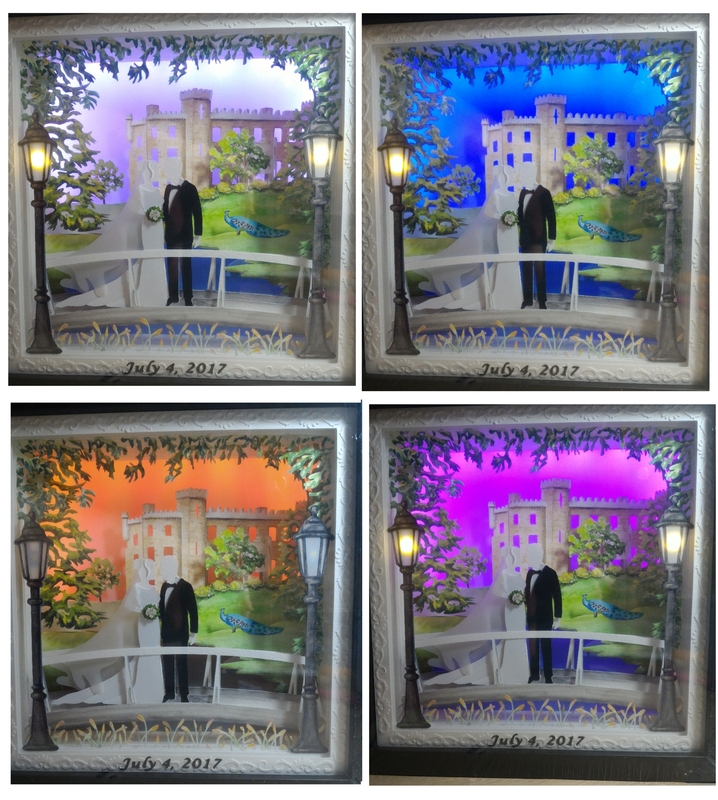 The 5inch deep frame was purchased from Michael's Craft store online on sale. I would love to purchase that file, is it yours? So pretty! Love your use of lights and changing background colors. @PaperCreations Thank you sooooooo much! Beautiful file! @PaperCreations thank you very much for your file. It is so interesting how you put this together. The colored individual pieces on top of the castle make such a difference. I don't know anything at all about the lighting; not sure I could put that together. It surely is a beautiful striking one-if-a-kind wedding card/gift. Your friends will keep it forever.